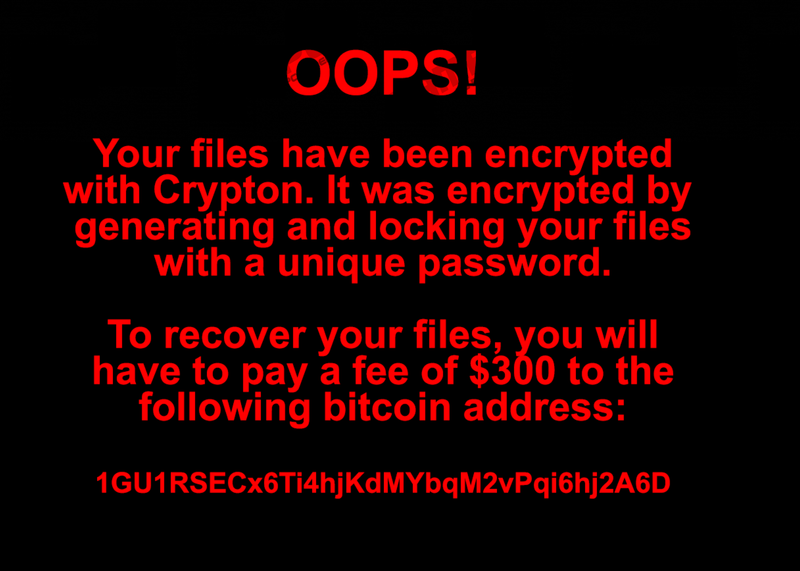 NETcrypton Ransomware is a very strange infection that, according to our research team, could encrypt all personal files found on your operating system. While it does not target files in the %WINDIR% directory and all system files, it can encrypt photos, archives, documents, media files, executables, and other kinds of data found on your PC. Files are encrypted using the AES encryption system, and they are given the “.encrptd” extension to help you identify them quicker. Otherwise, you would have to go through every file to check if it is corrupted. The good news is that once files are encrypted, decryption should be possible. That is because the infection creates the encryption key by combining CPU, HDD, and BIOS IDs into one string. It should be possible to reassemble the key and then decrypt files that way. Of course, the creator of the malicious ransomware wants you to believe that you can decrypt your files only by paying a ransom of $300. Do not pay the ransom because you files will not be decrypted anyway. Instead, focus on removing NETcrypton Ransomware. According to our research team, NETcrypton Ransomware is spread as a fictitious key generator, and, of course, it is spread via malicious websites. If you do not want to attract malware into your operating system, please do not trust unreliable and unfamiliar installers or visit untrustworthy websites. Once the devious ransomware is in, it shows a “WARNING” alert that asks if you want to execute the ransomware. This, of course, is a giveaway that you are dealing with an infection. If you click the “No” button, nothing will happen, but if you click the “Yes” button, a different window entitled “EaseUS Keygen” will open, and this is when the encryption will start. At the same time, NETcrypton Ransomware will create a copy of itself with a whitespace character in front of the original name. Then, this original file will be hidden to prevent you from deleting the infection. Of course, there is a way to delete this file, and you can learn how to do it by following the instructions below. As soon as the encryption process is completed, the threat will corrupt the background by setting up its own image. This image represents the ransom note. 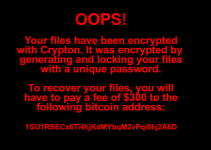 According to the ransom note, your operating system was corrupted by Crypton, but you should not mistake NETcrypton Ransomware for Crypton Ransomware. The ransom message also informs that you must transfer 300 USD to the 1GU1RSECx6Ti4hjKdMYbqM2vPqi6hj2A6D Bitcoin Address. As we have discussed already, this is not a good idea. If you have 300 USD lying around, we suggest investing it in security software that could keep your operating system protected in the future. On top of that, as we have discussed already, it should be possible for you to decrypt your files by reassembling the encryption key. If you do not know how to do that, you should be able to find a friend or hire a technician who would help. If your files are backed up, and you cannot be bothered with figuring out the decryption on your own, you can remove the corrupted files and then replace them with the backup ones. Of course, you will need to do that when you delete NETcrypton Ransomware. The instructions below show how to uncover the hidden launcher of the NETcrypton Ransomware. Once you delete it along with the copy, all there will be left to do is to change the wallpaper image. Of course, you should also perform a full system scan to check if no malicious leftovers are left behind. You can also utilize anti-malware software. This is the ideal option because this software will simultaneously erase existing threats and then reinstate full-time protection. Besides taking care of your virtual security, you should also remember to be more cautious online. Do not visit unreliable websites and do not download unfamiliar software. As you have learned by reading this NETcrypton Ransomware removal guide, even highly dangerous threats can conceal themselves to slip in. Open the Control Panel and then enter Folder Options into the search field on the top-right. Open the utility and then click the View tab. Select Show hidden files, folders, and drives and then click OK.
Right-click and Delete the launcher and its copy. Perform a full system scan to check for leftovers. Quick & tested solution for Netcrypton Ransomware removal.